While other areas of K12 technology environments have seen significant change, the filtering technology used in schools has generally remained stagnant. Filtering tools are both difficult to maintain and manage, causing problems for the end users. In an effort to address the gap between modern K12 technologies and the old-fashioned filtering technologies still used in K12 schools, Sergeant Laboratories developed AristotleInsight::K12’s Distributive Content Filter, a new tool that ensures all students remain safe while online. Traditional content filters sit on the wire, creating a choke-point for web traffic. Traditional content filters also struggle to work properly when devices leave the school network or request content secured by SSL/TLS protocols. This revolutionary new filtering technology allows educators to remain compliant with CIPA regulations by dynamically filtering web content, no matter the students’ location or device type. Unlike other filters, the AristotleInsight::K12’s Distributive Content Filter is effective even when specific content requires an SSL/TLS protocol. 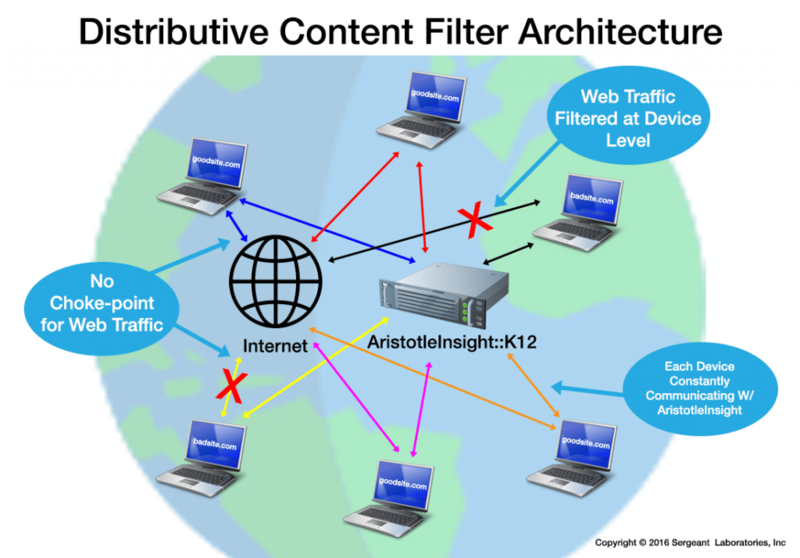 AristotleInsight::K12’s Distributive Content Filter works at the device level to eliminate network choke-points, regardless of device type or location. The solution also seamlessly filters content secured with SSL/TLS protocols. 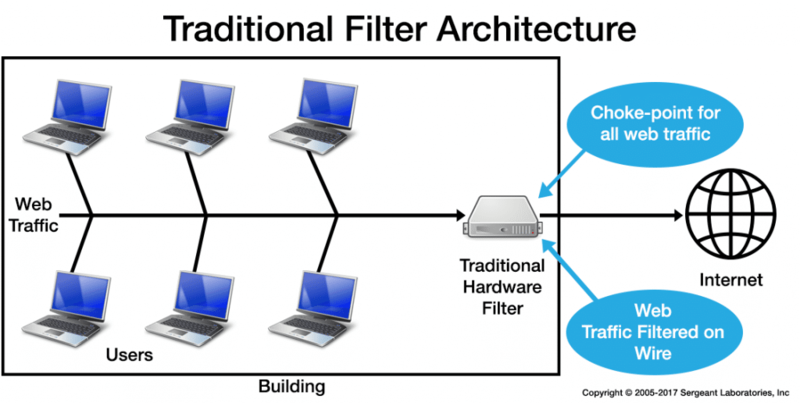 Traditionally, content filters require tremendous amounts of configuration to filter certain device types, like Chromebooks, and to provide off-campus filtering services. Filters that can accommodate Chromebooks too often create a choke-point on the network, since they must route all web traffic through a single hardware appliance before granting access. Additionally, these traditional filters must break security protocols to filter content protected via SSL encryption. AristotleInsight::K12 adopts a distributive design that can accommodate changes within the K12 technology atmosphere. This Distributive Content Filter can handily filter all device types, including Chromebooks, PCs and Macs, without creating a choke-point for web traffic. The filter can also accommodate SSL protocols for devices that are on and off campus. In the event that a student bypasses the web filter, AristotleInsight::K12 can deliver usage reporting data that will show administrators where the student navigated, how long they bypassed the web filter, and what they did. If the same individuals repeatedly bypass the filter or engage in other types of inappropriate behavior, parents and staff will receive automatic notifications. They can then intervene and create teachable moments. AristotleInsight::K12 has a proud history of serving as the price-value partner for K12 environments that are focused on creative, accountable, and safe technology use. By combining a Distributive Content Filter with AristotleInsight::K12’s capabilities including geo-location, forensic auditing, and utilization reporting, Sergeant Laboratories has provided a comprehensive solution for total CIPA compliance and better digital citizenship. AristotleInsight::K12 is implemented nation-wide to foster student visibility and deliver alerts in real-time on a range of devices, including PCs and Chromebooks. Now with improved CIPA compliant filtering, AristotleInsight::K12 will help educators create teachable moments and promote digital citizenship while safeguarding students and improving the digital learning experience. To learn more about the features of AristotleInsight::K12, including Distributive Content Filtering for Chromebooks, PCs, & Macs, visit www.aristotlek12.com or calling 866-748-5227.